The Capitals went into Sunday afternoon’s tilt with Ottawa hoping to awake their offense and leave behind their struggles against the Senators they way they broke their losing streak against the squad back in December. They got their wish in the third period, scoring three goals on the Senators and playing strong enough defense to pickup a pair of points. Lead onto the ice by goalie Michal Neuvirth, the Caps couldn’t awake the sleeping dragon early on Sunday. Early in the 1st, the Senators managed to get one past the Caps on a Mike Fisher wrist shot that Neuvy seemed to kick into the net. The Caps struggled to get their offense working until the third period, when it would spark together after a number of shakeups in the Caps’ lines. 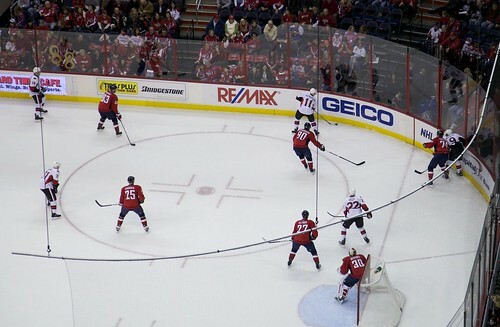 The Capitals put together two goals in about 45 seconds in third, with an unassisted beauty by Brooks Laich at 7:15 in the the third, and then followed up with a John Carlson slapper in the first two seconds of a power play at 8:00 even to throw the momentum into the Caps’ favor at a crowded Verizon Center. 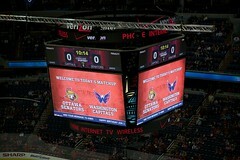 Laich’s first goal electrified the crowd and woke them from listlessness, and Carlson’s follow-up set the crowd ablaze. “Once we get one, the crowd gets into it and the guys start rolling,” said Brooks Laich after the game. The win was pretty important for the Caps’ season, especially as they head out on a three-game, five day road trip through the East. They’ll need to pickup four points on this trip to stay where they are in the standings, and would need six points to go ahead.